When my high school buddy Bill Mansfield suggested that I take up the fiddle, I visited the Raleigh flea market and found an old but decent-sounding, factory-made violin for $40. While acquiring my instrument proved easy enough, I had no teacher and no idea where to find one. It was challenging to even locate recordings of fiddle music. In this era of iTunes, YouTube and music camps, it is hard to imagine a modern age when the only resources available to an aspiring old-time fiddler were a small group of peers who were also trying to learn and whatever LPs happened to be in the “Folk Music” bin at the local record store. Jim Collier, Margaret Martin, Bill Mansfield, Wayne Martin, with their biggest fan. Washington, D.C. I tried to pick up tunes by playing with Bill and listening to our talented classmate, Jim Collier, play his banjo and fiddle. I also managed to acquire three record albums—two volumes of “Old-Time Music at Clarence Ashley’s,” and “Mountain Music of Kentucky”—that made a big impression on me. I did not realize at the time just how accomplished these musicians were and that it would take decades to get to a point where I could play good versions of the tunes heard on these recordings. What I soon discovered, however, was that learning from records was a very slow process and that I needed to be around accomplished fiddle players in addition to hearing them on recordings. After I enrolled at Duke University I met Bill Hicks and Sharon Sandomirsky Poss—members of the Fuzzy Mountain Band—at a house party in Durham. The Fuzzy Mountain Band always acknowledged the sources of the tunes they played and made an effort to integrate regional styles of playing into their own music. Band members made field trips in order to record older musicians, which inspired me to try to do the same. Margaret was working at the Duke Primate Center and funded our purchase of a Uher 5-inch reel-to-reel recorder for my use. My main objective was to record musicians whom I could learn from, so I began my documentary efforts by visiting Tommy Jarrell in Surry County, North Carolina and Taylor and Stella Kimble in Laurel Fork, Virginia. Around that time Margaret and I started making music with Sharon and her husband, Barry Poss, who was a graduate student in Sociology at Duke and a very good clawhammer-style banjo player. When the four of us would go to fiddler’s conventions, we would make time for side trips to seek out older fiddlers and banjo players. It was also through Barry and Sharon that we discovered the world of pre-war commercial recordings of stringband music. I well remember a New Year’s Eve in the offices of County Records in Floyd, Virginia when Barry and I stayed up all night long to listen to Dave Freeman’s wonderful collection of 78 rpm records. In 1977 I transferred to the University of North Carolina at Chapel Hill and enrolled in folklore classes taught by Dan Patterson. Dan taught that fieldwork was a critically important element of folklore scholarship that went beyond its value as a source for learning to play, though he respected that motivation as well. He encouraged me to get out into communities and document southern traditional music. Frank Proffitt, Jr., Wayne Martin, Margaret Martin, Concord, NC, 1983. After graduation I knew that I wanted to do cultural work as well as continue to improve my fiddle playing. Choosing this path required patching together work in order to make ends meet. For several years Margaret and I traded turns working on contract for George Holt’s newly created Office of Folklife Programs running “Folk Music in North Carolina Schools” It amazes me now to think who we were taking to public schools: Algia Mae Hinton, Harvey Ellington and Sam Pridgen, the Briarhoppers, Snuffy Jenkins and Pappy Sherrill, Lauchlin Shaw, Ola Belle and Bud Reed and many others. Margaret and I also played music full-time for a few years and I had a short stint with the National Park Service at Cape Lookout National Seashore, where we met a number of excellent traditional musicians from coastal communities. During my travels I was constantly asking about local fiddle players and by the mid-1980s had met a number of musicians whose styles and repertoires had been shaped by their families and local communities prior to the advent of the recording industry and radio. I made some audio recordings but felt that video documentation of these musicians was needed and a small grant from the North Carolina Arts Council was the critical support needed to fund this effort. In 1987 videographer and folklorist Nancy Kalow and I documented Lauchlin Shaw, Smith McInnis, Harvey Ellington, Joe Thompson, Homer “Pappy” Sherrill, Walt Probst and Lonnie Austin from the Piedmont; Jess Albertson, Ben King, C.L. Scott, Clennie Davis, and Otho Willard from the coastal plain; and Luke Smathers, Benton Flippen, Melvin Slayden, Earnest East, Thomas Hunter, Doug Wallin and John Rector from the mountain region. In 1988 I joined George Holt’s staff as a full-time employee. While this was a permanent state position that required a fair amount of administrative work, it turned out to be a golden opportunity. George recognized the need to create a documentary record of older North Carolina musicians who were still active at that time. He had acquired some excellent tape recorders and microphones to use for fieldwork, including a reel-to-reel Nagra that made extraordinary audio recordings. For about a six-year period, whenever I could carve a day or two away from the office, I packed up this equipment and traveled across the state to record musicians in homes, community centers and churches. I tried to make repeat visits to musicians whose artistry was extremely powerful and, in my opinion, merited deeper documentation. In several cases these efforts resulted in the production of audio recordings that gained musicians wider public recognition. 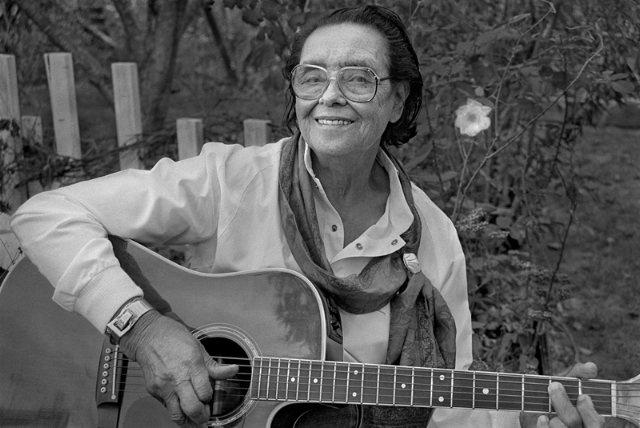 Etta Baker had achieved some national attention in the early days of the Folk Revival after her extraordinary guitar picking was documented by Paul Clayton in 1956 and released on an LP entitled “Instrumental Music of the Southern Appalachians.” However, no one I knew had ever seen her or even knew whether she was still living. I learned later that she did not perform in public because her husband did not approve of her playing outside of the home and that she had acceded to his wishes until his death. In the early 1980s my colleague Glenn Hinson reported that Etta was in good health and eager to take her music to new audiences. 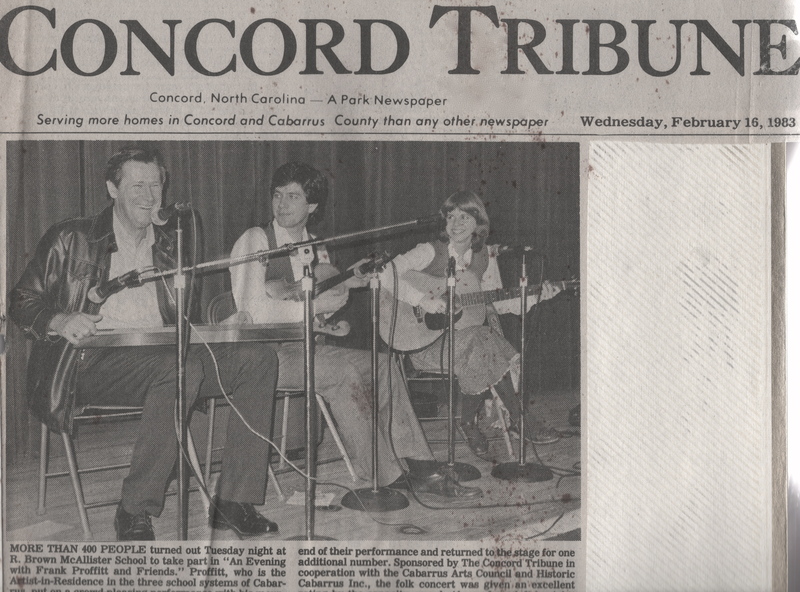 In 1986, when Margaret was a Visiting Artist at Pamlico Technical College, we performed in a concert organized by guitarist Tom Winslow at Vance-Granville Community College in Henderson, North Carolina. Tom had also invited Etta and we struck up an acquaintance. To our great delight, Etta invited us to visit her in Morganton and we began our friendship. After I began work with George Holt, I asked Etta if she would be interested in making a recording, a proposition to which she quickly agreed. In the next two years, I traveled to her home in Morganton and made audio recordings in order to accumulate material for a CD. Lesley Williams, who also worked with the Folklife Office during this time, collaborated with me on this project. Lesley and I produced a master tape of Etta’s recordings and wrote a set of liner notes for Rounder Records, which issued Etta’s “One-Dime Blues” in 1992. The CD focused upon Etta’s exquisite guitar picking, but her family loved stringband music and Etta also played fiddle and some banjo as a girl. When I visited she would often ask me to take my fiddle out of the case and she would pick up a banjo. Etta gravitated even more to the banjo as she got into her nineties and playing guitar required more strength than she could muster. In 2003 Tim Duffy, the founder of Music Maker Relief Foundation, recorded a session with Etta playing the banjo, David Holt on guitar and myself on the fiddle. Tim released these performances on the CD Etta Baker: Banjo. photo by Cedric N. Chatterley. I became acquainted with Lauchlin Shaw in 1976 when Barry Poss took me to visit Virgil Craven, a fine fiddler and hammered dulcimer player. Lauchlin, along with guitarist Fred Olson and banjo player Glen Glass, would meet at Virgil’s modest home in the mill community of Cedar Falls in Randolph County to make music on Sunday afternoons. Barry had persuaded Virgil and his band to allow him to bring his recording equipment to their sessions and make some audio recordings. My memories of the trips to Cedar Falls include the sparkling dance music created by the group as well as the strong sense of manners and protocol the members exhibited. The older men courteously addressed one another as Mr. Craven, Mr. Glass and Mr. Shaw. Invariably, the band would break after an hour or so of music to eat cake and other sweets baked by their wives. Not long afterward, I saw Lauchlin Shaw again when I began presenting traditional musicians in public schools. My first program was scheduled in an elementary school in Asheboro and I invited a local banjo player, Glenn Davis, to perform. Mr. Davis asked Lauchlin and Fred Olson to accompany him. After the performance Lauchlin invited me to music sessions that he and his wife, Mary Lilly, hosted in the old Shaw family homeplace on their farm in Harnett County. To my surprise, their farm was less than an hour’s drive from my home in Raleigh. Margaret and I began to attend the Shaws’ parties with regularity. I was initially drawn to Lauchlin because of his skills as a fiddler. After getting to know him, I began to appreciate his strong work ethic, which was coupled with a deep sense of personal responsibility. The fields on his two hundred-acre farm were always mowed and beautiful to the eye, his garden free of weeds and bountiful with vegetables, and the wood racks under the shed full of cords of evenly cut and precisely stacked oak even in the midst of summer. Lauchlin was a proud descendant of Highland Scots who settled the Cape Fear River valley, and I often wondered how much of his industry was part of a Scots heritage and how much was due to his own unique personality. A.C. Overton and his wife Ava lived near Garner, relatively close to our home in Raleigh, and A.C. and I began playing music together in the late 1980s. Because he used picks and sometimes employed a third finger in his style, some labeled A.C. as a bluegrass musician. In actuality, his playing was thoroughly within a two-fingered banjo picking tradition but his powerful rhythm, creative picking techniques and beautiful chord voicings took his playing to a high plateau that defied categorization. Lauchlin and A.C. had each learned from older family members, and they played a regional repertory that reached back into the nineteenth century. I began to make high fidelity recordings of their music in 1988 and soon had more than enough material for a CD. Sally with the Run-Down Shoes was issued on the Merimac label in 1996, and is now out-of-print. Fred Olson, Lauchlin’s daughter Evelyn, and I provided accompaniment on the recording. After Lauchlin died in 1999, A.C and I spent many evenings together playing fiddle and banjo tunes and often had the pleasure of accompaniment by Margaret or by A.C.’s musically talented children, Gerry and Glenda. A.C. differed from many traditional musicians I had known both in his interest in acquiring new tunes and his unusual talent in devising creative and exciting back-up on the banjo for pieces he was learning. Fortunately, I recorded some of the music we made during this period. A.C. passed way in 2007, and Margaret and I make it a point to see Ava, Gerry and Glenda a couple of times a year and play pieces that A.C. loved. George Holt had visited with a number of older singers from the storied ballad-singing tradition of Madison County, North Carolina and felt that Doug Wallin of Sodom Laurel was one of the best. George wanted to document Doug’s artistry and quickly convinced me of the merit of this idea. Doug, however, was initially wary of the idea. I think it was his friendship with George, and perhaps his interest in my fiddle playing, that persuaded him to allow us to visit. Our initial trips to Madison County in 1991 quickly taught me that Doug had strong passions; he had a tender side that was sentimental and motivated by a belief in an idealized form of “true love.” On the other hand, his deep feelings could also ignite a fiery temper. He had taken offense during the 1960s at John Cohen’s efforts to document his parents’ music, and it took more than a little coaxing for Doug to let us record him. The project had its fits and starts, however. On at least two occasions Doug took offense from a perceived slight from another singer or musician within his home community and “retired” from music. Thankfully, he would eventually get back to the point where he enjoyed company, singing the old love songs and playing his fiddle. Doug’s home was in one of the most picturesque mountain settings that I have ever experienced. His house was a mile or more up a mountain and the narrow rock-strewn path that served as the road passed through branches and laurel thickets that were a challenge to negotiate even in good weather. Doug told us that his mother remembered English folk song collectors Cecil Sharp and Maud Karpeles coming up this same road to visit and document ballad singers. They appeared during the time of the First World War and local residents suspected them to be German spies. Sharp and Karpeles had visited several of Doug’s relatives, including Mitchell Wallin and Viney Norton. Doug possessed a copy of Sharp and Karpeles’ publication, English Folk Songs From the Southern Appalachians, and liked to discuss the titles and texts of the ballads presented in this work. Doug lived alone in the four-room homeplace where he was raised and his brother Jack lived nearby, also by himself. I assumed that Doug never married because he was the son who stayed at home to care for his mother, Berzilla, when she grew feeble. I knew Doug after his mother had died and was impressed at his self-reliance. He raised a garden, cooked meals for himself and Jack and cut loads of firewood for the old wood heater. He tended a patch of burley tobacco every year until he was old, which gave him some cash to get by on during the year. Doug did not have a driver’s license, and he stayed close to home except for an occasional trip with Jack to the small town of Marshall. 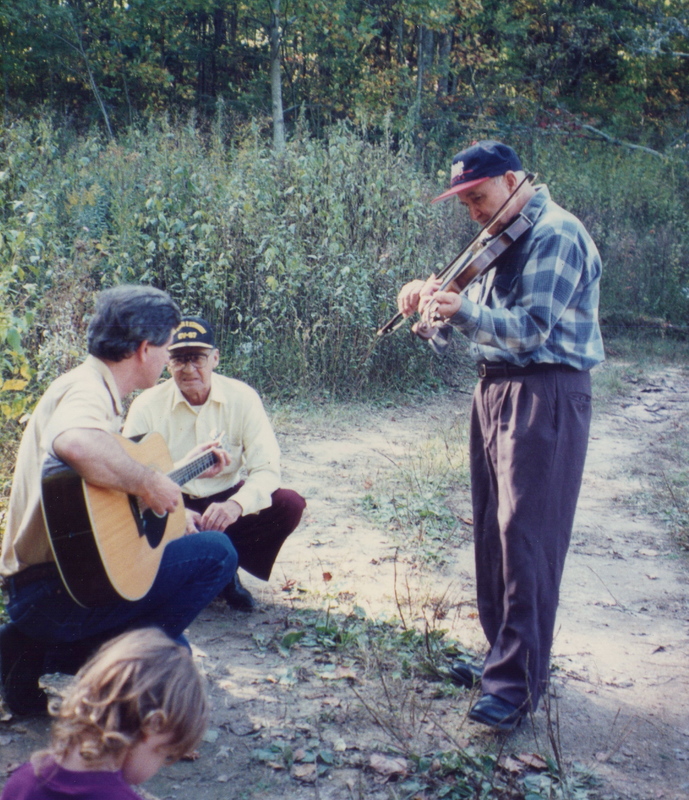 Singing and playing stringed instruments were an important part of Doug and Jack’s family heritage and music was fully integrated into Doug’s life. I got the strong impression that he played his fiddle and sang love songs on almost every day of the year. I remember him telling George and me that would go to bed soon after the sunset and would sometimes sing ballads as he lay in bed in the dark. While Doug was best known as a singer, he had a deep interest in fiddling. 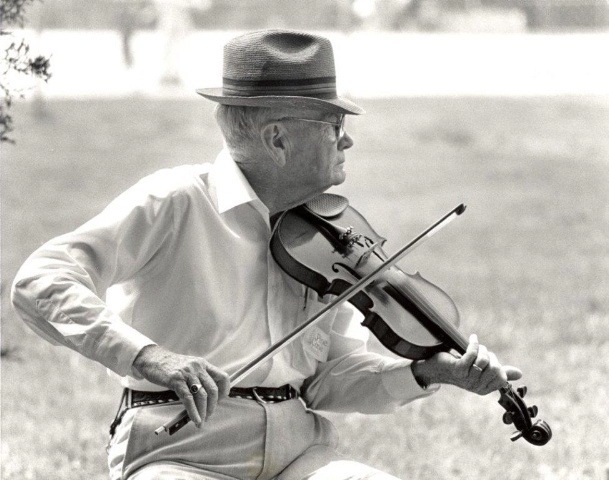 On almost every visit he would request that I get my fiddle out of the case and play his favorite tune, “Cumberland Gap.” After I fiddled for a while I would get a guitar and back him up on some of the dance tunes he played. Doug had also worked out fiddle introductions to the ballads he knew. He played the melody on the fiddle once or twice through and then put the fiddle down and sang the verses. Doug realized that he was a more gifted singer than a fiddler, but I learned a lot from hearing him play. He said that he preferred “lonesome” notes and the way that he used double stops, or chords, to evoke emotion was unlike any fiddle playing I have heard before or since. Quite apart from Doug, Jack Wallin possessed a gregarious and optimistic nature. He was the younger brother, had sons, and traveled beyond Madison County more than Doug. He understood that even though they were brothers, his and Doug’s musical styles and influences reflected different eras and ways of living. Jack was easy to talk to, friendly and always ready to make music. His singing, guitar and banjo playing proved to be important additions to the recording project. Jerry Adams, a Madison County native and a wonderful old-style banjo player, also participated in several sessions that were recorded in Doug’s home. Doug Wallin died in 2000 and Jack Wallin, in 2005. 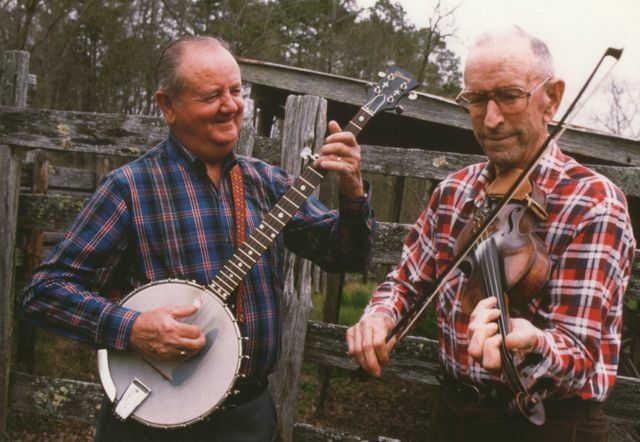 Fortunately, they saw the release of some of the field recordings made by George and myself on a 1995 Smithsonian Folkways CD entitled Doug and Jack Wallin: Family Songs and Stories From the North Carolina Mountains. Beverly Patterson, who had joined the Folklife Program staff, and her husband Dan, collaborated on the production of the CD. It brings me much satisfaction that Doug and Jack’s music was made available to more people and that they themselves were pleased with the recording. 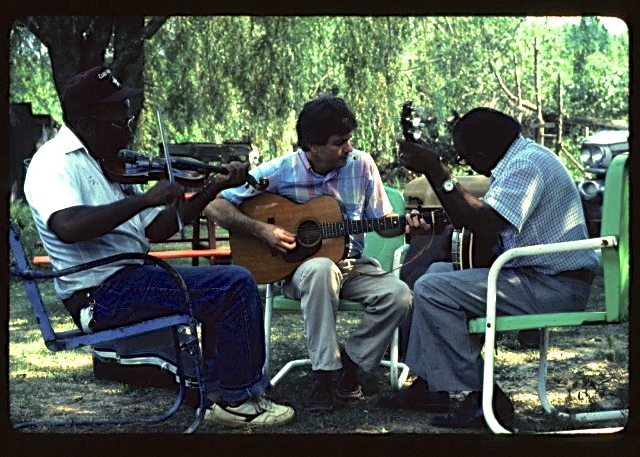 By the early 1980s I became aware of the work that fieldworkers and revivalist musicians including Kip Lornell, Tommy Thompson, Cece Conway and Glenn Hinson, had done in the previous decade to record African American stringband musicians Joe and Odell Thompson, Dink Roberts and John Snipes, who lived near Chapel Hill and Durham. I have to admit that as an aspiring fiddler, when I heard the syncopated banjo and percussive fiddling on these field recordings, it sounded discordant to me. My opinion changed radically in 1987 when I undertook the project to videotape older fiddlers and I visited cousins Joe and Odell Thompson in their homes. Perhaps my tastes had matured, or Joe and Odell were in better practice than they had been a decade earlier. Whatever the reason, when I heard them in person their powerful playing made a deep impression. I began visiting regularly and they asked me to accompany them on guitar when they played locally. 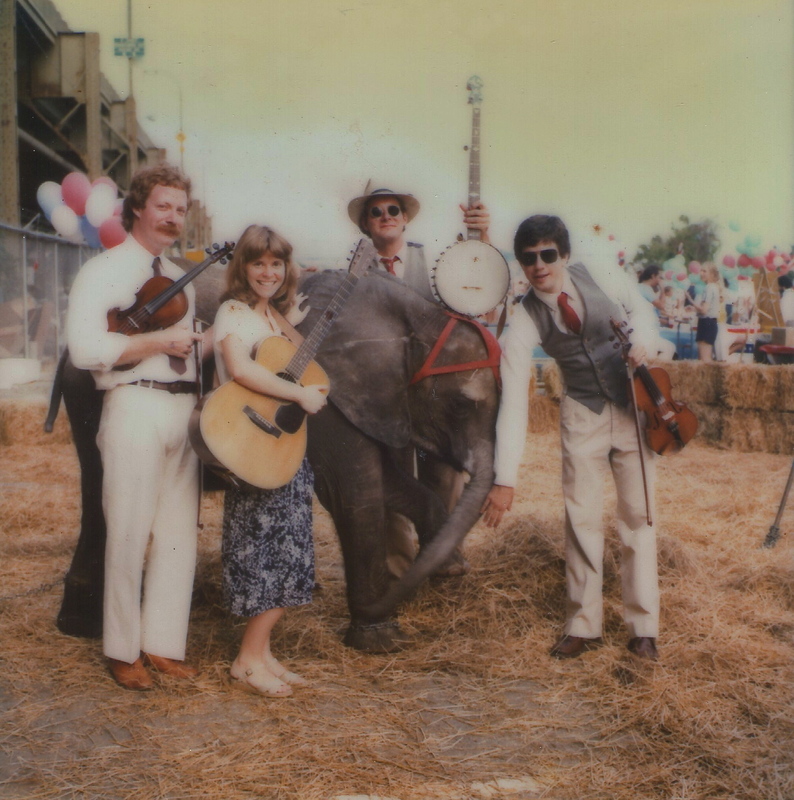 In 1991 I traveled with the Thompsons to Port Townsend, Washington for the Festival of American Fiddle Tunes. After the week-long event the Festival Director, Peter McCracken, arranged a tour to towns and cities in Washington and Oregon. In addition to the Thompsons and myself, the tour included Clyde Davenport, Bobby Fulcher, Sheila Adams, John Dee Holeman, and Josh Graves and Kenny Baker. The death of Odell Thompson at MerleFest in 1993 is one of my saddest memories. Odell was a warm and generous person and I feel fortunate to have known him. His banjo playing and singing was inspirational and I remember well his view on timing. He was an advocate of letting the music “ease on out” rather than playing fast. In contrast, being present to see Joe Thompson receive the National Heritage Fellowship in 2009 was one of the most satisfying moments of my career. What Joe accomplished in the twilight years of his life is truly amazing. More than anyone else, Joe deserves the credit for inspiring younger generations of African American musicians to take up the fiddle and the banjo. My friendship with Lauchlin Shaw opened my eyes to an ongoing tradition of music-making in the piedmont region of North Carolina. An array of talented banjo and guitar players came to the Shaws’ music parties—Marvin Gaster, A.C. Overton, Robert Temple, Wade Yates, Fred Olson, Price Saunders, Robert Cashwell and Lester Haney, among others. They told stories about being raised on farms and learning their music through family members and neighbors. Rural life and the rough years of the Depression taught them practical knowledge—how to raise vegetable gardens, hunt and fish, repair machinery, and make music—that made them seem quite self-sufficient and confident.